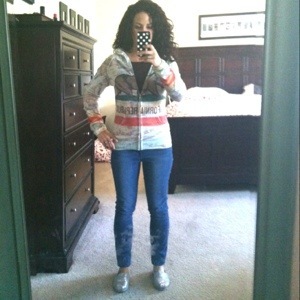 Yes, those are my toddler son’s handprints all over my mirror! 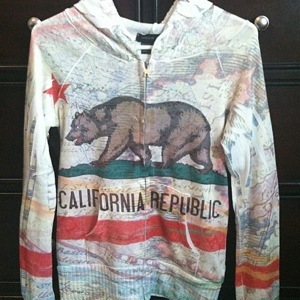 Deals and Details: A few months ago I bought this California Republic map print hoodie in a tourist shop in Huntington Beach. I think it is fun and interesting. According to SHEfinds map or geography print clothing and accessories is the newest trend. I had no idea I was this fashion-forward! LOL! I teach U.S. History and am a California native so it is perfect for me to wear on casual days to work or on the weekends. I like that it is extremely lightweight, so I will be able to wear it on cool summer evenings. Hope you had a great Monday! Stay fabulous and be frugal!